Colorado St vs Colorado – 6pm FS1: This could be one of the best versions of this game in years. Both coaching staff’s have turned around losing programs. Look for a hard fought game. Oakland A’s at LA Angels – 7pm MLB.TV: Great series and probably the best pitching match of the series with the A’s Jon Lester squaring off against the Angels Jered Weaver. UNLV at Arizona – 7:30pm ESPN: Both teams are starting brand new QB’s. UNLV is coming off of their best season in years. Watch out Cats. Ohio State at Navy – 9am CBSSN: This may be closer than the experts think. Ohio State was not good on defense last year and Navy is Navy. It’s a disciplined triple option attack. Chelsea at Everton – 9:30am NBC: Everton just fell apart in the last 20 minutes against Arsenal last week. They have to do better if they want to beat one of the favorites to win the league in Chelsea. Colorado Rapids at Seattle Sounders – 1pm MLS LIVE: If Colorado wants any shot at the playoffs they have to come away with at least a point in this match. Clemson at Georgia – 2:30pm ESPN: Oh this might be the best game of the weekend. It was a fun game last year and should be again. New QB’s on both sides too. Wisconsin vs LSU – 6pm ESPN: Both teams have some questions to be answered at the QB position. Either way, it’s two teams that could and should challenge for titles in their respective conferences. Liverpool at Tottenham – 5:30am NBCSN: Liverpool just got hammered by Manchester City on Monday. They do get reinforcements though in the form of Forward Mario Balotelli. New York Red Bulls at DC United – Noon NBCSN: Battle of top teams in the Eastern Conference. Milwaukee Brewers at SF Giants – 1pm MLB.TV: Getaway game between two playoff teams. Winnipeg Blue Bombers at Saskatchewan Roughriders – 1pm ESPN3: Neck and neck in the Western Conference standings. Something has to give and the Roughriders get one of their better slotbacks back in the form of Weston Dressler. Utah State at Tennessee – 4pm SEC Network: See one of the best QB’s in college football in Utah State’s Chuckie Keeton. Tennessee is going to need to harness every ounce of talent they have to win this one. SMU at Baylor – 4:30pm FS1: If you like defensive struggles then don’t watch this game. Points a plenty are expected. NASCAR – 4:30pm ESPN: It’s getting down to the nitty gritty before The Chase. They are in Atlanta which means they pretty much won’t touch the brake pedal. Cleveland Indians at KC Royals – 5pm ESPN2: KC has been an absolute buzzsaw the last month or so. Cleveland is still sneaking around the playoff hunt. Detroit Tigers at Cleveland Indians – 1pm ESPN: A little divisional Labor Day baseball for you. Edmonton Eskimos at Calgary Stampeders – 1:30pm ESPN3: The battle of Alberta continues. Miami at Louisville – 5pm ESPN: It’s Louisville’s introduction to ACC football. Washington Nationals at LA Dodgers – 5pm MLB.TV: Another playoff preview for your viewing pleasure. With the 2014 College Football season knocking at the door one sad fact is creeping around the chicken coop, students are not going to the games. Yes, even at Alabama. ESPN’s Darren Rovell wrote an excellent piece earlier this year about the decline of the student body at football games. We are not talking about the non power conferences either. He points to places like Michigan, Alabama, Arizona, Georgia and Oklahoma that have seen a drop off in student attendance. The concern isn’t just that students are not showing up but that the students are the next generation season ticket holder. It means future declining revenue and sparsely populated stadiums which is a double whammy of bad news for some schools. The University of Iowa was going to give away free tuition to randomly selected students who purchased season tickets. Some legal hurdles put an end to that idea but it shows the lengths that schools are willing to go to to put butts in the seats. It makes sense that college football programs have checked out to places like Kansas City to visit Blue Hell (a.k.a. Sporting KC) and other MLS clubs. MLS clubs like Sporting KC, Portland and Seattle sell-out just about every match and a great fan experience to boot. Granted everyone but Seattle is filling a facility around 20,000 people which is far less than places like Alabama, Michigan, and Oklahoma but they are still doing something right to continually bring it sell-out crowds. College Football has a lot of hurdles facing it from lawsuits to concussions. Support from the students they represent didn’t seem like it would be an issue but somehow those are always the ones that sneak up on you. Pittsburgh Steelers at Philadelphia Eagles – 4:30pm NFL Network: Maybe there will only be 25 penalties in this game. Either way it’s football on a Thursday night. Real Salt Lake at FC Dallas – 6:25pm NBCSN: Two teams out west jockeying for playoff position. Arsenal at Everton – 9:30am NBC: Watch US National Team and World Cup hero Tim Howard go against one of the favorites to win the Premier League this season in Arsenal. 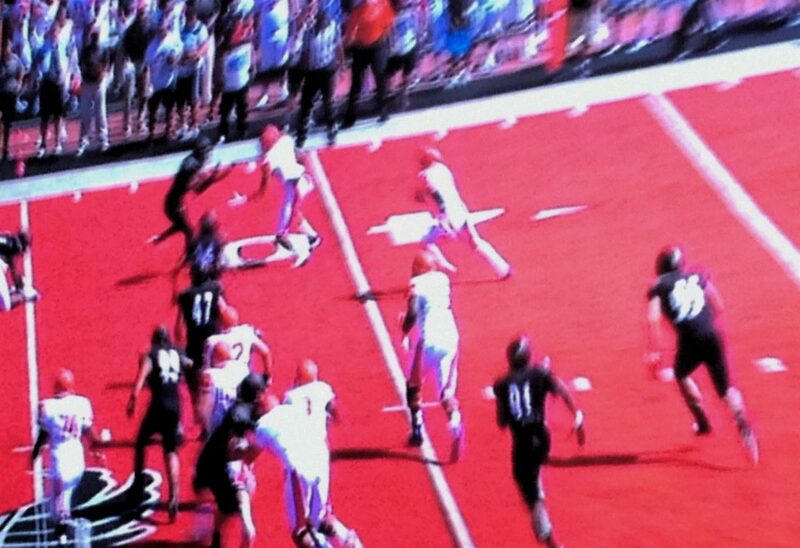 Sam Houston St at Eastern Washington – 12:30pm ESPN: YES! IT’S ACTUAL COLLEGE FOOTBALL! SF Giants at Washington Nationals – 1pm FS1: Two potential playoff teams meeting at the end of August. Should be fairly intense. Toronto Argonauts at Edmonton Eskimos – 1pm ESPN3: Toronto QB Ricky Ray makes a return to Northern Alberta to meet his old team. NASCAR from Bristol Motor Speedway – 4:30pm ABC: Little short track racing East Tennessee style. Arena Bowl XXVII: Arizona Rattlers vs Cleveland Gladiators – 5pm ESPN: Well either Phoenix or Cleveland will walk away with an actual trophy. DC United at Sporting KC – 5:30pm MLS LIVE: The top two teams in the Eastern Conference square off in Blue Hell. LA Angels at Oakland A’s – 6pm MLB.TV: Good pitching matchup with C.J. Wilson vs Jon Lester. Little League World Series Final – Noon ABC: It’s for all the marbles. Seattle Sounders at Portland Timbers – 2pm ESPN2: The best rivalry in MLS in arguably the best atmosphere in North American soccer. Saskatchewan Roughriders at BC Lions – 4pm ESPN3: This should just be an awesome football game. LA Angels at Oakland A’s – 5pm ESPN: Getaway game for the two top teams in the AL West and in Major League Baseball. Liverpool at Manchester City – Noon NBCSN: The two teams who competed for the title last year face off in the second week of the season. Take a long lunch. Does anybody remember the music industry back in the 90’s? When you would buy a $15 CD at Tower Records? No? Well apparently some sports and media entities don’t remember either because they are making some of the same mistakes that the music industry did 15 years ago. The Premier League threatens to sue their fans for posting a low quality video of a goal. Seriously. Instead of figuring out a way to quickly distribute this content on their own the Premier League’s answer is to take legal action against their fans. Instead of embracing the social sharing economy the Premier League turns it’s back on it in favor of the ‘old school’ way of doing things like selling the goal rights to the Sun which then charges user £8 a month (about $13 US) for the right to see a goal they may have missed. Now flash back to 2000-2001 and the age of Napster. Instead of creating a user friendly digital distribution model the music industry sued Napster. Then it went after the music fans themselves for downloading music they wanted to hear. Why? Well the record companies felt that people should have to buy the $15 CD to listen to that one song they might like. The artist, executives, marketing and truck drivers all need to get a piece of that $15. Damn how the user wants their content. In the end the users won and we now have the ability to buy an entire album or just a song and for less money. We now have the ability to stream or download, better price fluctuations and more devices and outlets than ever before. The Premier League should be embracing this not discouraging it. They should be standing on top of the mountain and shouting to the world how great a goal was. They should want the world to see it.They shouldn’t be running away from it. This is an opportunity not a burden. How do they go about it? It’s pretty simple actually. First, stop the current model they have. Selling the rights to someone else is just a cop-out. Second, set up a digital command center in London (or Manchester if you like). Have all the feeds of all the Premier League games fed into this location and a person assigned to each game. That person’s job is to pull out those moments as they happen. That same person compresses the video and pushes it to a repository where there is a another person, a social media producer so to speak, who decides which amazing moment should be tweeted out or posted to Instagram or uploaded to YouTube, etc. This guarantees that high quality content is sent out from the Premier League accounts. This helps dominate in SEO and drives eyeballs back to the Leagues other revenue generating properties like YouTube (if they had a channel which they don’t which should tell you something about their backwards way of thinking). In other words, this can be a revenue generator which is a good thing. The NFL, MLB, NHL and others have a command center. If the Premier League doesn’t then they should really think about taking the term ‘Premier’ out of their name. This isn’t difficult. The fact that the Premier League’s modus operandi is to sell the rights to someone then threaten to sue people who do not use that service does say alot about the business practices and lack of creativity at the top. If the metamorphosis of the music industry tells us anything its that the users are going to win in the end. The faster you accept that the better off and more profitable you will be. Jacksonville Jaguars at Chicago Bears – 5pm ESPN: This may be the only time the Jags will ever be on anyones ‘must watch’ list….ever. But this is the only football game in town. Philadelphia Eagles at New England Patriots – 4:30pm NFL Network: It’s Chip Kelly vs his old buddy Bill Belichick. Hey, it’s preseason football. Milwaukee Brewers at LA Dodgers – 7pm MLB.tv: Could be a playoff preview. Seattle Sounders at Real Salt Lake – Noon NBCSN: Two top teams in the west in Salt Lake. Could Seattle finally fall out of first? Seattle Mariners at Detroit Tigers – 4pm MLB.tv: Your pitching matchup, King Felix vs David Price. You’re welcome. LA Galaxy at Columbus Crew – 4:30pm MLS LIVE: Columbus needs 3 points here to get back into the playoff picture. But that’s easier said than done with the ‘Landon Donovan Goodbye Tour’ in full swing. UFC Fight Night – 7pm FS1: Main event features Ryan Bader (wrestler from Arizona St) vs Ovince Saint Preux (football player from Tennessee). Also Ross Pearson vs Gray Maynard and Tim Boetsch vs Brad Tavares. Manchester City at Newcastle United – 7:30am NBCSN: It’s a tall order for the defending champs. It’s also the best game of opening weekend for the Premier League. Denver Broncos at SF 49ers – 1pm NFL Network: First American football game in the 49ers brand new Levi Stadium. BC Lions at Toronto Argonauts – 4pm ESPN3: If preseason NFL Football isn’t your thing then check out the best game of the weekend in the CFL. 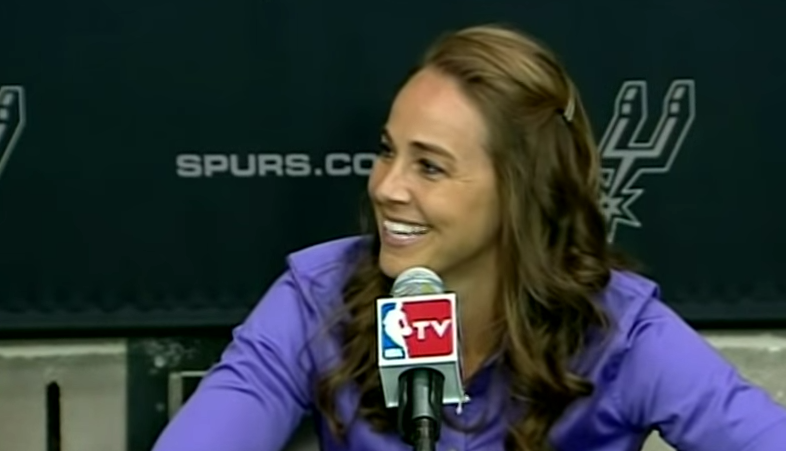 Becky Hammon is a woman and now an assistant coach for the NBA Champion San Antonio Spurs. Yes, a woman is an assistant coach for an NBA team. A team made up entirely of men. It also couldn’t be a more perfect situation for a more qualified individual. Hammon is someone everyone says was going to be a coach at some point. One could assume most people didn’t think that it would be with an NBA franchise must less the defending champions. But she is and by all accounts more than qualified to make a great team even better. The Spurs are an NBA backwater. Meaning that it’s not Los Angeles, New York, Chicago or Miami. Yet they have been one of the most consistent and successful organizations in the NBA. Winning five NBA titles since 1999 with a head coach, Gregg Popovich, who is one of the best in history. A smart, thorough man with a track record of success. Now he and the Spurs are making history, again. The Spurs have thought outside the box many times before. They have the most diverse roster in the NBA with six players born outside of the US. Popovich and his staff have been able to bring these diverse backgrounds together into a championship team. When you think about it this way, Hammon’s hiring doesn’t seem that unusual because Spurs have put aside prejudice many times before choosing instead to focus on finding the best qualified people regardless of location or in this case gender. Hammon’s hiring is ground-breaking any way you cut it. Time will tell if she will be a success or enough of a success to become an NBA head coach one day. The fact that we are finally going to get a chance to find out is a huge step forward. Next question is when does a team from the MLS, the NHL, NFL or MLB hire a woman coach? PGA Championship – 10am TNT: It’s the last major tournament of the year and Tiger is playing. Detroit Tigers at Toronto Blue Jays – 4pm MLB.TV: It is a possible playoff preview. San Jose Earthquakes at LA Galaxy – 8pm NBC Sports: The first game of the Landon Donovan farewell tour. Cleveland Browns at Detroit Lions – 4:30pm NFL Network: Johnny Football Pro debut anyone? Colorado Rapids at FC Dallas – 6pm MLS Live: Two teams separated by 3 points in the standings battle for vital points. DC United at Real Salt Lake – 7pm MLS Live: One of top teams in the East meets one of the top teams in the West. Detroit Tigers at Toronto Blue Jays – 10am MLB.TV: It’s a nice Sunday pitching matchup as David Price heads to the mound for Detroit and Mark Buehrle for Toronto. Sporting KC at Vancouver WhiteCaps – 5pm MLS Live: Vancouver is a tough place to play and they need points. SKC though is the probably the best team in MLS right now. Washington Nationals at Atlanta Braves – 5pm ESPN: Getaway game for two teams battling for control of the NL East. Houston Dynamo at Seattle Sounders – 7:30pm ESPN2: Houston is starting to turn it on and Seattle has been struggling as of late. By now you have probably seen or at least heard about Paul George’s horrific injury during a scrimmage for USA Basketball last weekend. It’s an injury that will probably keep George out an entire season and one that raises the question, should NBA players be playing international basketball? Mark Cuban doesn’t think so. However players do it in other sports like soccer. While it is a very tough blow to George’s regular team, the Indiana Pacers, something like this could have happened regardless. It’s a risk that is taken anytime someone competes. It could have happened to George while practicing at home. Heck, the Buffalo Bills lost a key defensive player for the year as he prepared for the upcoming season. International tournaments are not unique to basketball. The biggest international competition of all just took place in Brazil. Soccer players have been playing in international tournaments like the World Cup since the sports inception and most of the time they play qualifiers during their club teams season. Some may say that a middle ground might be for NBA teams to have a say in which of their players can participate in international tournaments but there again you can find precedent in soccer. On occasion club teams do not release their plays to play for their country for various reasons. Most of the time it is because a friendly falls during the club’s preseason. From the club teams point of view it’s a game that doesn’t matter because no qualification is on the line. While George’s injury is unfortunate it in all likelihood will not stop NBA players from playing for Team USA on the international stage. Mark Cuban may not like it but it’s true. Other sports are able to pull it off and while it’s not perfect it does seem to work.